Ted Cruz’s latest eye-grabbing campaign video touts his “Trusted” conservative position on immigration. 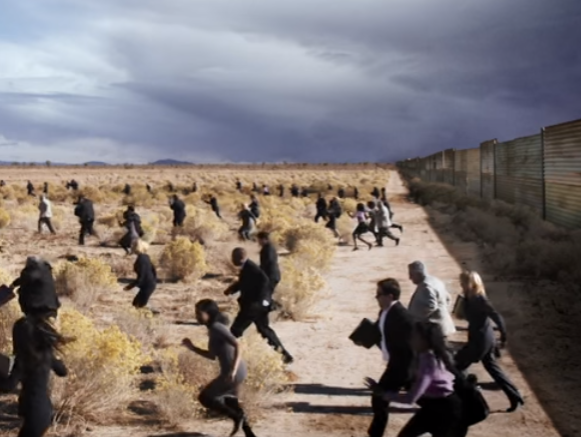 Titled “Invasion,” the one-minute video brings a populist anti-immigrant message features people dressed in business attire crossing the U.S.-Mexico border. The video is earning free press by being interesting and well-shot, another head-turning video in a long series; Simpsons characters, cooking bacon on a gun, or using his daughters as props in a parody holiday book reading. “When the mainstream media covers immigration it doesn’t often see it as an economic issue," Cruz says in a voice-over as people in suits and ties run through the desert and clamber across a river. "The politics of it would be very, very different if a bunch of lawyers or bankers were crossing the Rio Grande or if a bunch of people with journalism degrees were coming over and driving down the wages in the press." The video is earning predictable responses: online viewers on the left call the video racist or xenophobic, (while supporters on the right make racist or xenophobic comments in support of Cruz). Occasionally, policy, economics and other issues are discussed. The real purpose of the video of course is to take on Cruze’s main rivals, Marco Rubio and Donald Trump. Trump released his on primary ad on Monday, which included a mention of building a border wall. In comments on Cruze’s video, you can see the micro debate that’s emerging between their respective supporters. Rubio is featured in Cruz’s video, staring blankly for a second in a GOP debate. Aside from the obvious irony of the message -- Cruz is a Harvard-trained lawyer and an immigrant -- the images of people running through the desert and across a river in heels or dress shoes is hilarious. More than just polarized, responses to the video are pretty funny, as is the video itself. Note: some of these comments are implicitly or explicitly racist. If you don’t think racism or racists can ever be laughed at, stop now. We reviewed comments posted by readers of news articles about the video, as well as posts on YouTube, where it was originally posted. In each case, we’re citing the username, but we can’t authenticate the account. Along the way, we found some funny quips. Here are our top 7. What we first noticed is that a lot of people didn’t really get the point of the ad, which is to argue that elites support immigration because it working class jobs are threatened by immigrants (whether or not this is true is up for debate). The funniest example of this comes when a Trump supporter thinks that Cruz is “glorifying” illegal immigration. Dan F: I Think Trump is better on this issue, I don't see [businessmen] crossing the border in suits. [Cruz] was glorifying the illegals in this. Christian Publishing House: +dan f I do not think you understood the message. THE POINT: If [white collar] workers were coming across the border, taking the jobs of [white collar] workers (lawyers, journalists, doctors, teachers); then, the media and big business would have already put up a wall. I hope this has helped. Dan F: I had to rewatch it, yes I agree with [Ted’s] message. I think Trumps ad was easier to understand. This is not glorifying illegal border crossing. Yes, even the most simplistic campaign ads can be too complicated for some. But before you judge too harshly, check out this response from FWD.US, a pro-immigration advocacy group who also appeared to completely miss the point of the video. “Senator Cruz has massively flip-flopped from championing high-skilled immigration as an ‘unambiguous good’ and calling for a 500% increase in H-1Bs and a needed, substantial increase in green cards to now saying immigrants take jobs from native-born and depress wages,” the group said in a press-release. Cruz did recently call for a 180 day halt of H-1B visas after supporting them for years. Cruz said that highly-skilled immigrant workers will create more jobs. He’s never made this claim for less-skilled immigrants. “I don't trust Canadians﻿,” writes KratostheDogtheMan on YouTube. “Illegal immigration has been so hard on me. I always dreamed of that strawberry picking job in California's Central Valley but had to settle on being a Software Engineer because of all the illegals,” writes GlamazonBarbie on YouTube. But it’s an actual comment in response to the Ted Cruz video, on Hot Air. “Once Trump wins the nomination, there won’t be anyone for the vulgarian howler monkeys to howl their vulgarities at. They may revert to human at that point. “Vaya troglodita, xenofóbico, racista, una cosa es seguro vas a perder! LOSER﻿,” writes Costa Sisal on YouTube. Troglodita translates from Spanish roughly as “neandertal.” Ouch. What do you think of the Ted Cruz video? Let us know in the comments below.